TBS is isotonic and non-toxic to cells and is suitable for molecular biology. 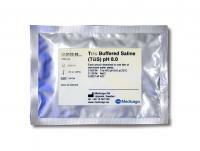 The buffer is commonly used as substance diluent or as wash buffer in immunoassays such as ELISA. It is used in immuno-histochemical staining when the background is high and for diluting alkaline phosphatase or peroxidase-conjugated antibodies in Western blotting. 2. 10 x solution; 0.5 M Tris buffered saline, 1.38 M sodium chloride, 0.027 M potassium chloride with pH 8.0 at 25°C. 3. 1 x solution; 0.05 M Tris-HCl buffer, 0.15 M sodium chloride with pH 7.6 at 25°C. Empty one pouch or dispose one tablet in a laboratory flask or beaker placed on a magnetic stirrer. Add 200 ml of deionized water for the tablets and 500 ml for the pouches and stir the solution for a few minutes. Adjust the volume up to 500 ml or 1000 ml, stir until full dissolution and the buffer is ready to use. TBS buffer is shipped at room temperature. Store tablets and pouches in a dry place at room temperature. Shelf life is three years after production date.